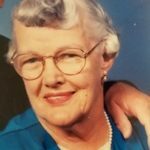 Added by Bill Bowman on March 17, 2018. 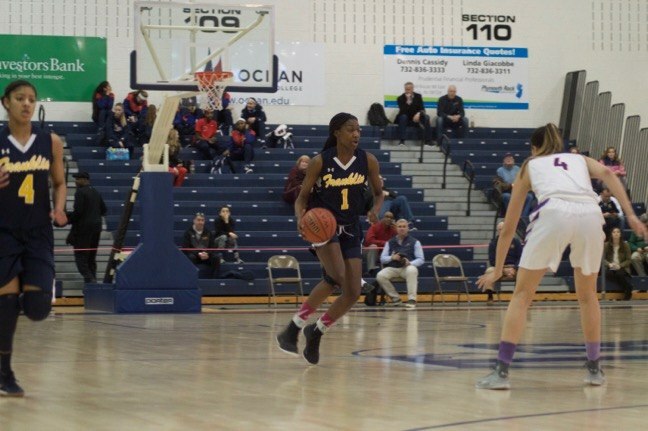 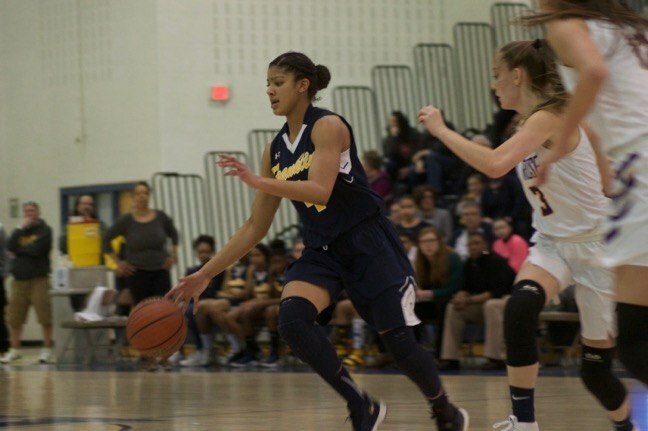 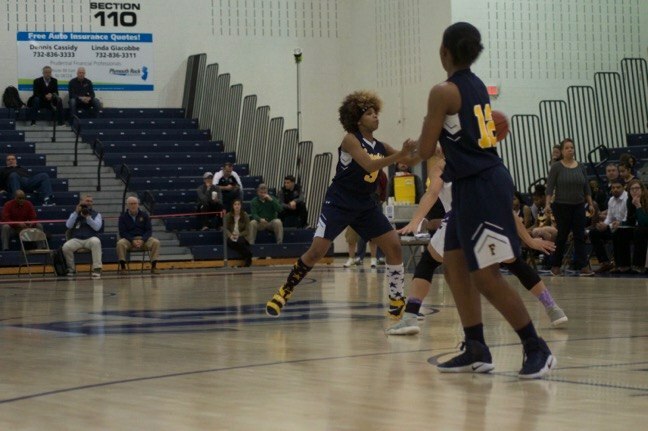 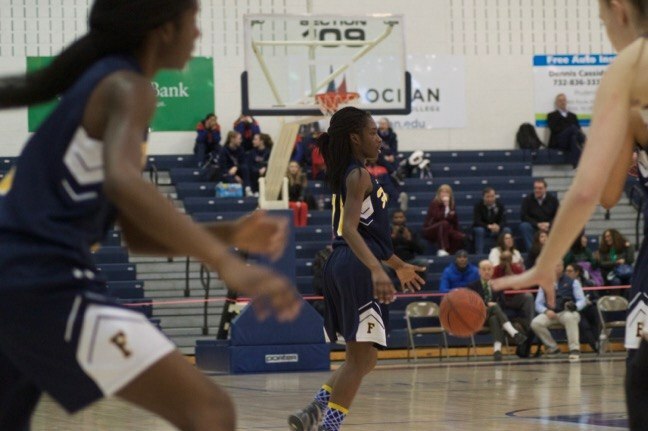 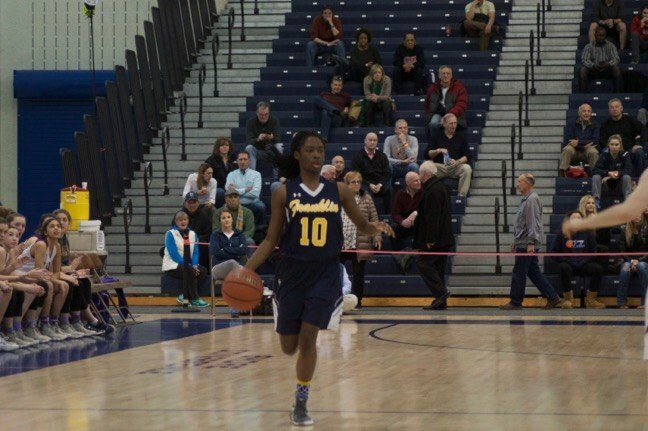 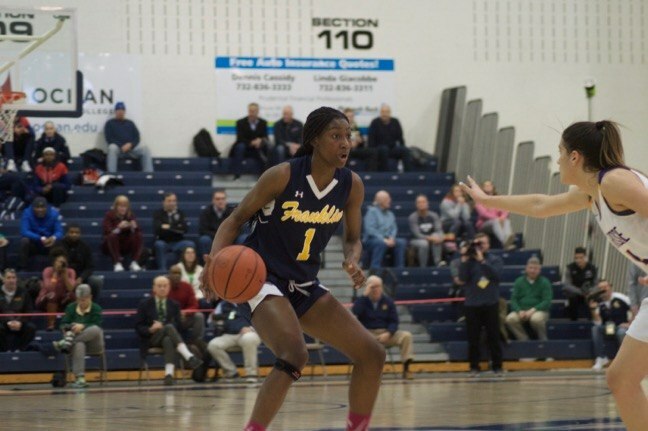 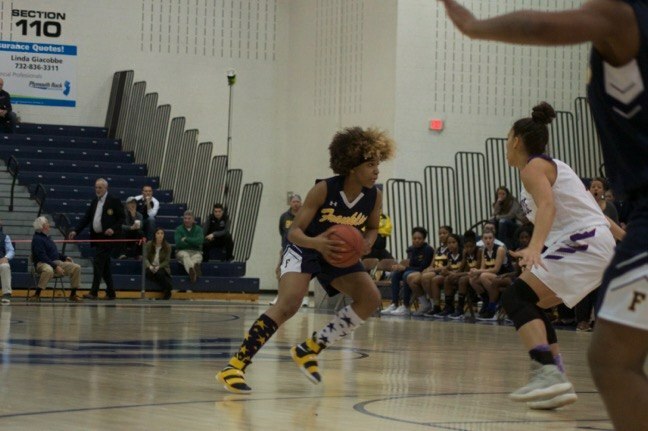 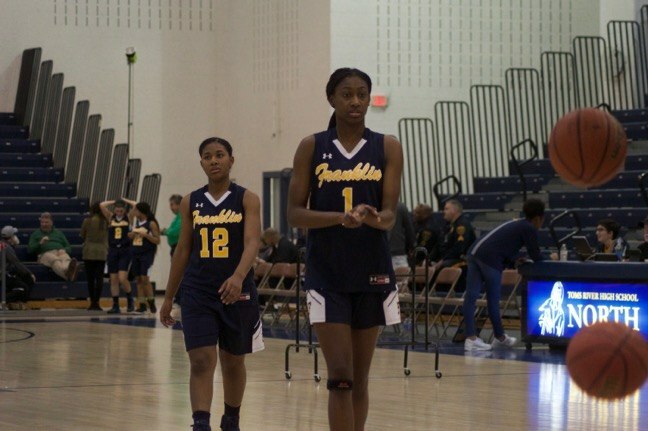 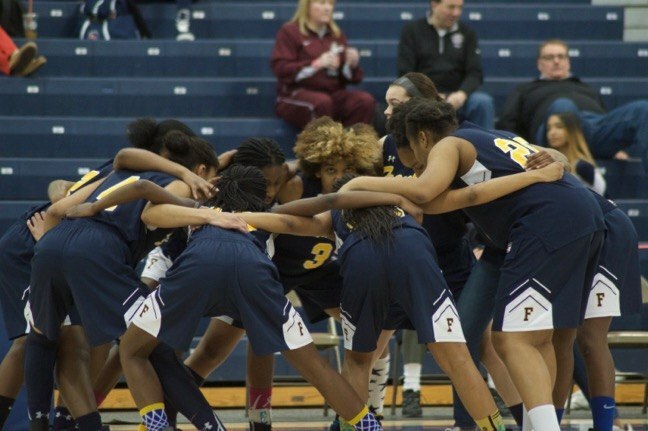 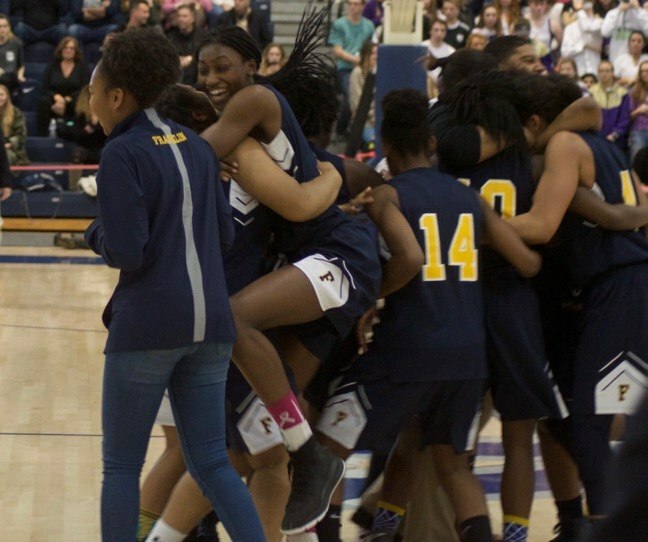 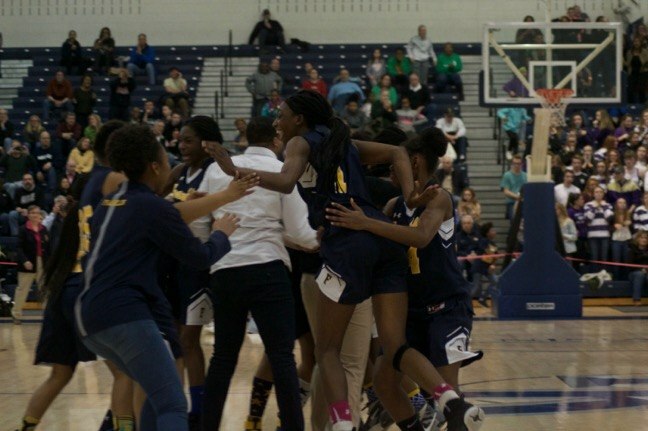 The Franklin High School Lady Warriors secured a return trip to the Tournament of Champions finals with a 56-53 comeback overtime win against St. Rose of Belmar. 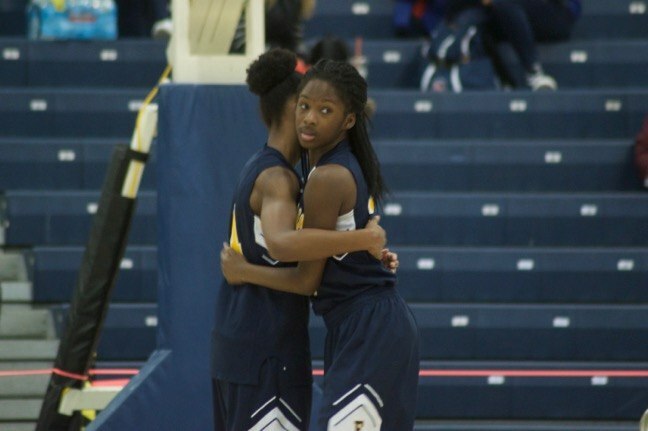 The confidence was not unwarranted. 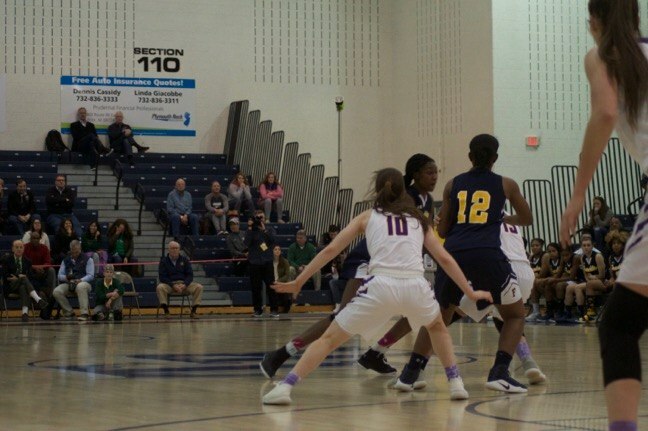 Miller and her fellow Lady Warriors had, during the preceding 32 minutes of playing time, erased St. Rose’s varying leads – one as big as 12 points – and ended regulation play tied 48-48 after some spectacular shots that seemed to have put the momentum in their corner. 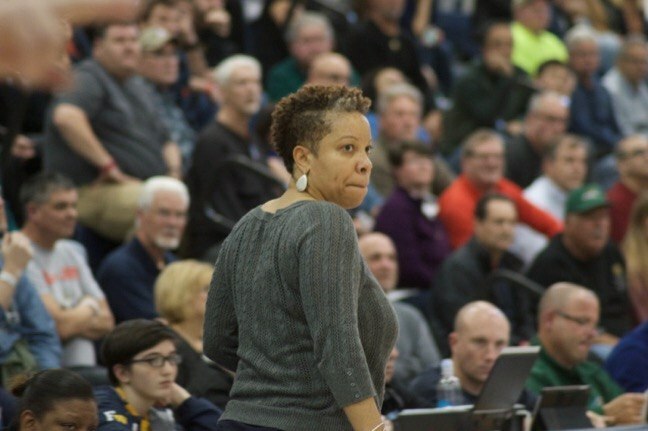 Her confidence was also not misplaced. 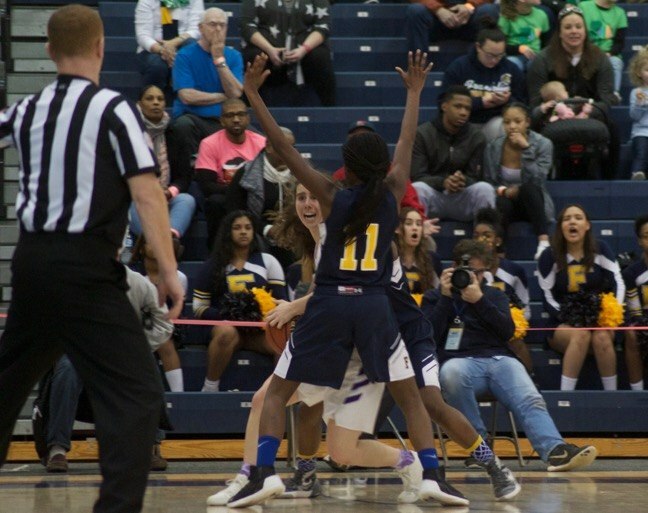 Powered by the free-throw shooting of Camille Gray, Kiersten McCloud and Kennady Schenck, a clutch three-pointer by Schenck and a spectacular block by Miller of a last-second three-point attempt by St. Rose, the Lady Warriors did, in fact, have it. 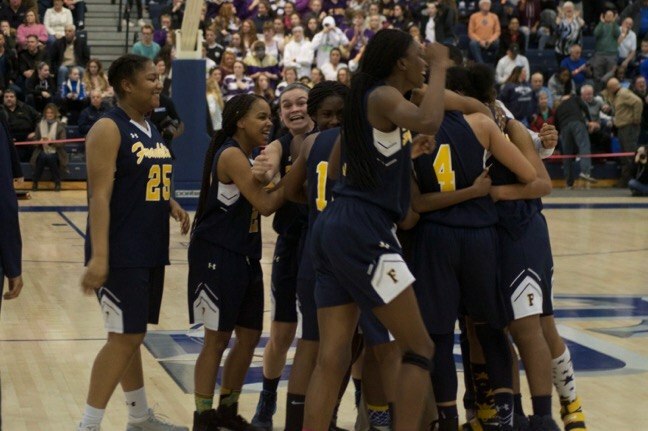 The “it” being the win in the quarter-final NJSIAA Tournament of Champions game, which gave them a return ticket to the final game against Manasquan March 17 at Cure Insurance Arena in Trenton. 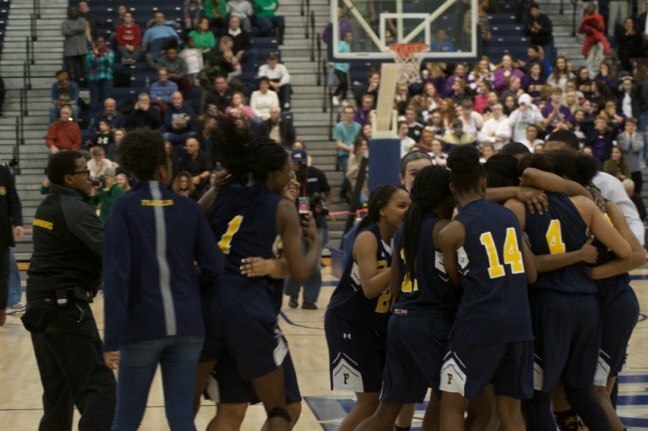 The Lady Warriors will make their second consecutive trip to the final game, with the same opponent as they had last year. 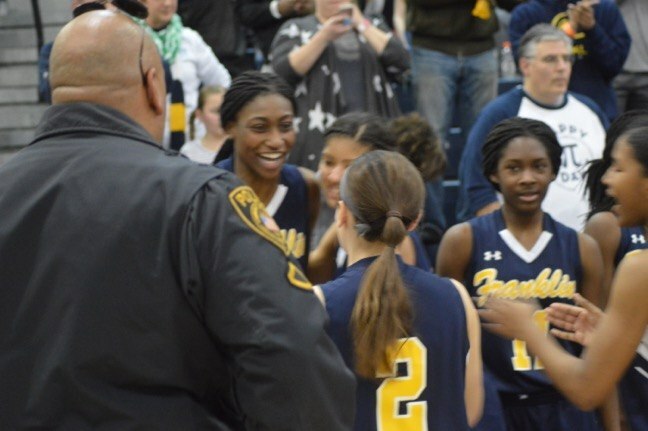 Getting that ticket did not seem a sure thing for about three-quarters of the game. 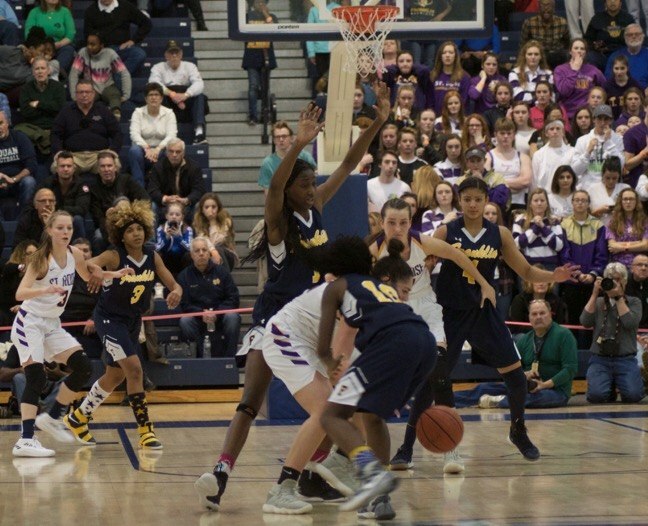 Stymied by a strong St. Rose defense that was all but impenetrable on the inside and stingy with allowing shots from outside the box, the Lady Warriors had to fight to stay in the game practically from the opening tipoff. 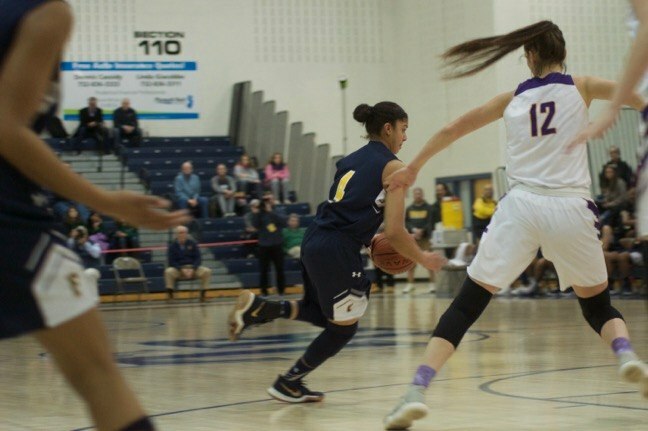 The Purple Roses opened up a 9-point lead with about 1:41 left in the first quarter, which they led 15-7 at the buzzer. 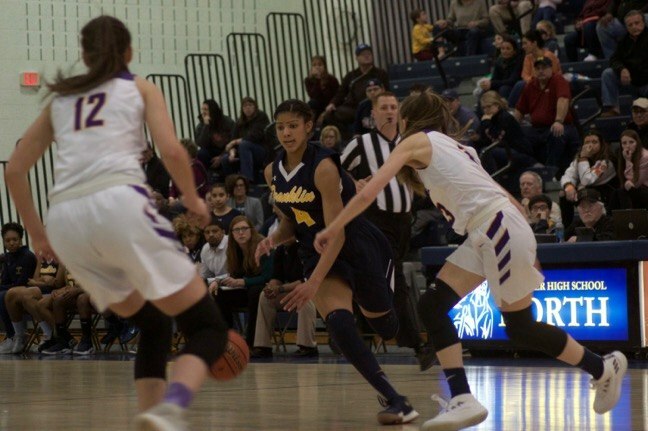 After the Lady Warriors pulled within six points following Miller’s three-pointer about 1:10 into the second quarter, St. Rose went on a five-point run before Franklin scored again, a shot in the paint by Keona Schenck. 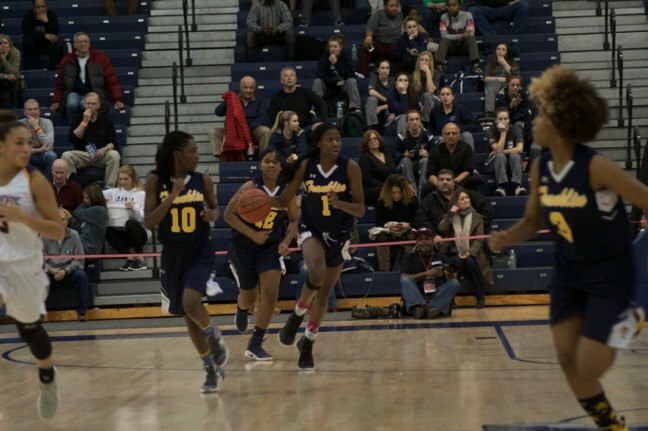 The two teams traded shots for the remainder of the frame, leaving for halftime with St. Rose rebuilding its nine-point lead. 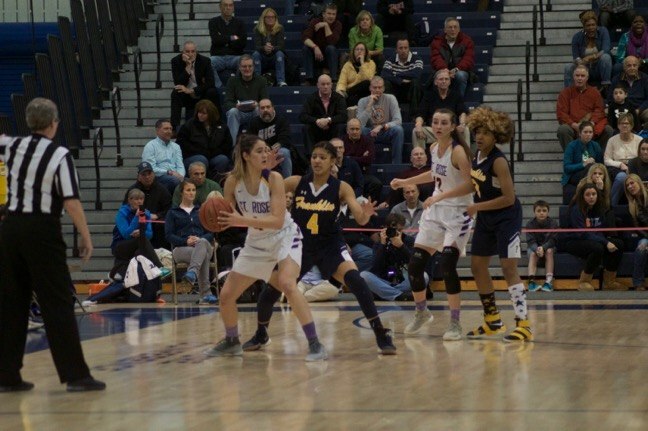 The teams shot comparably in the first half, with Franklin hitting 30 percent of their field goal attempts, and St. Rose scoring 31 percent of the time. 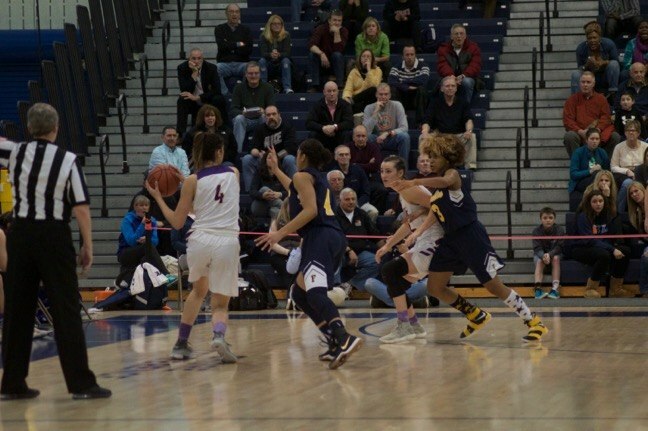 The Lady Warriors found themselves in the deepest hole in the game during the third quarter, when the Purple Roses led by as many as 12 points. 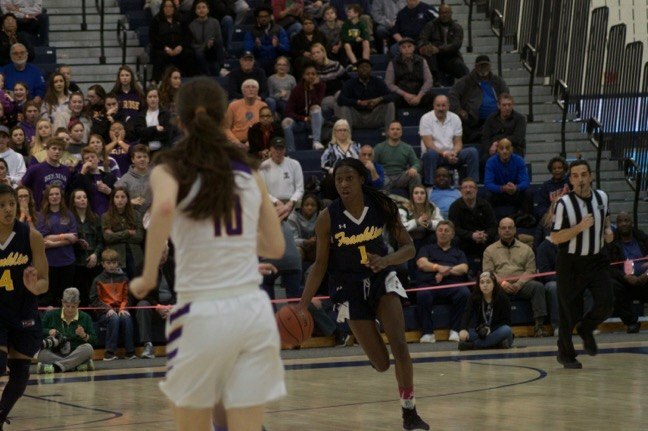 Franklin managed to crawl back, with St. Rose ahead 35-24 with 3:48 left in the quarter, Keona Schenck dropped two free-throws, Miller hit from outside the arc, and Gray scored in the paint, bringing the score to 35-31 at the buzzer. 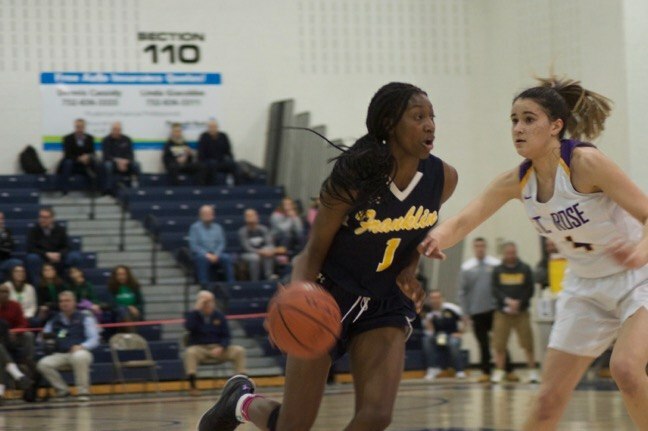 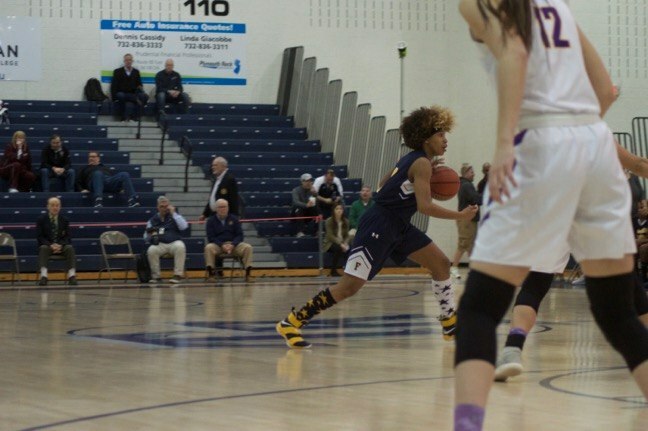 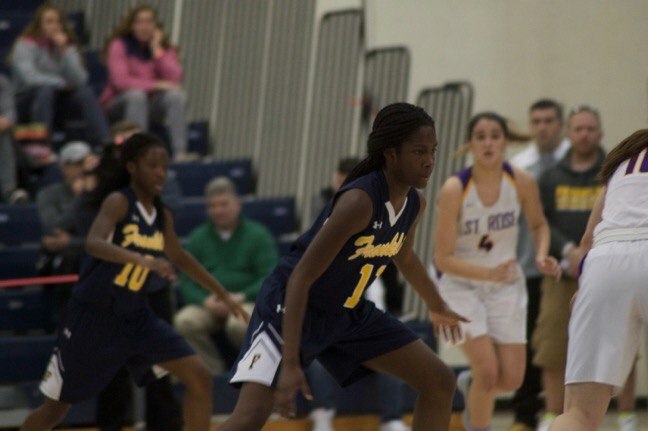 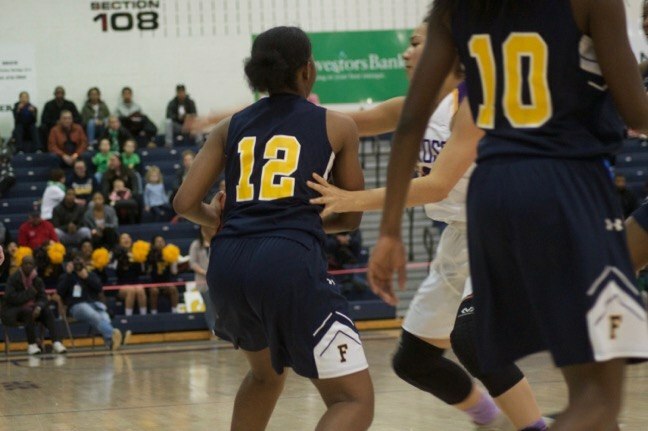 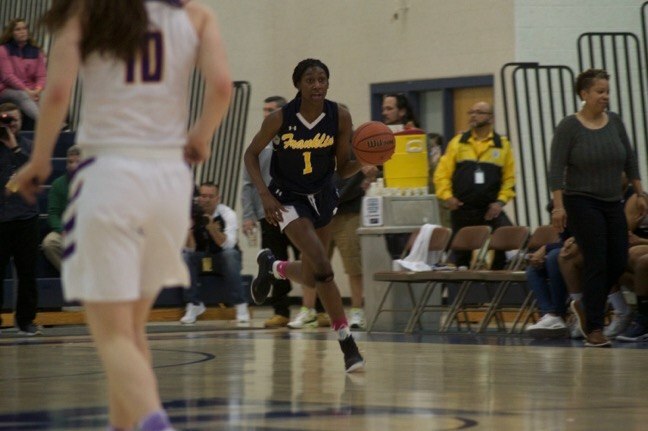 The fourth quarter saw Franklin playing catch-up to the Purple Roses, just to have St. Rose jump a little farther ahead each time the Lady Warriors drew close. 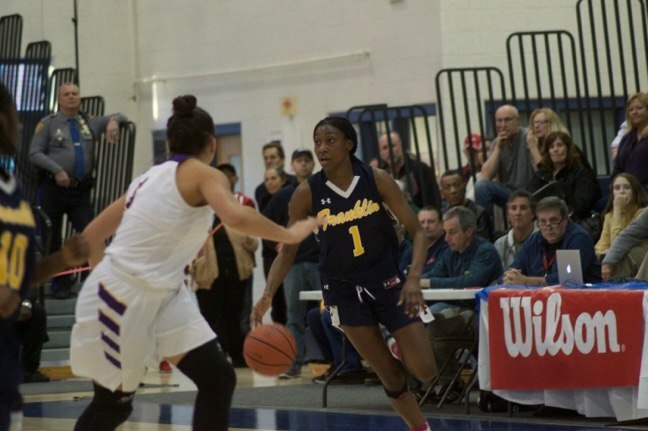 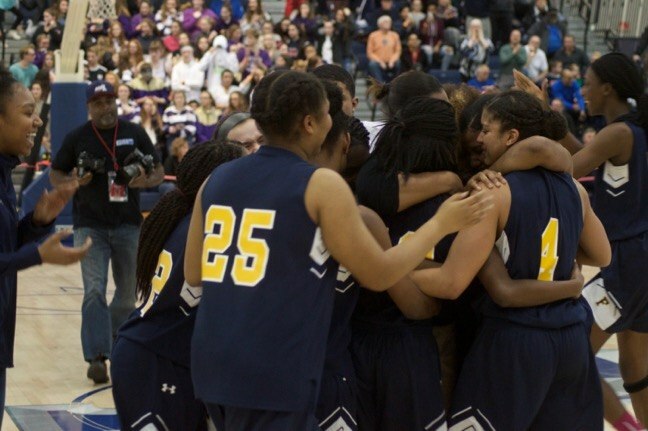 The task was complicated by the fact that Miller, Gray, Tiana Jackson and McClood each carried four fouls. 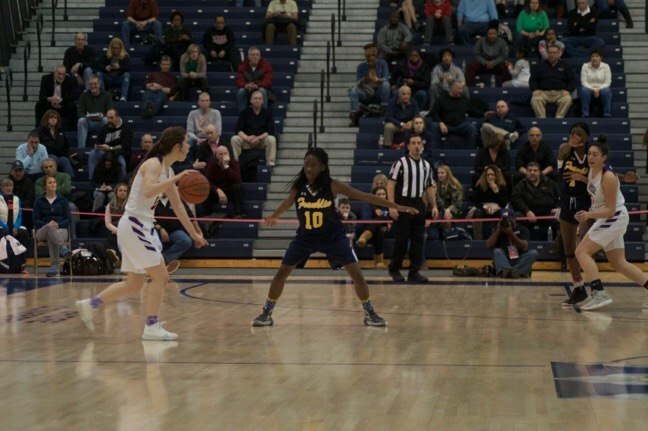 Miller said she didn’t let the fouls change her style of play. 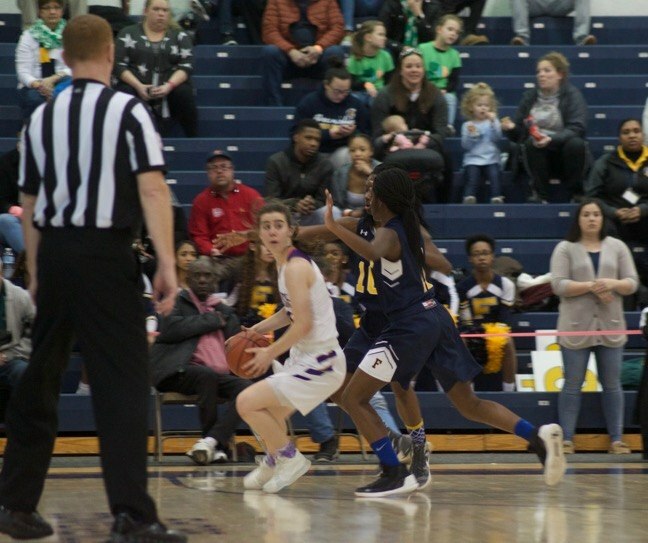 With the score 46-41 with 2:15 left to play, Keona Schenck scored from the paint to bring the Lady Warriors within three, 46-43. 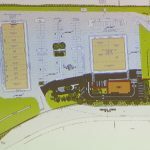 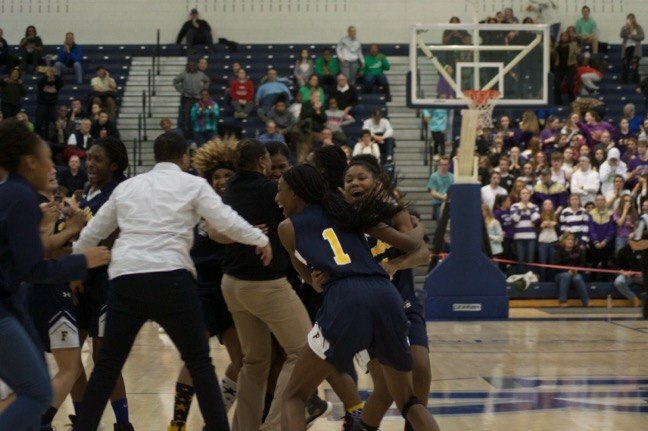 Then, with 1:24 left in the game – and the Lady Warriors’ season – Miller hit from the top of the arc for a three-pointer that tied the game and ignited the Warrior Nation on the bleachers. 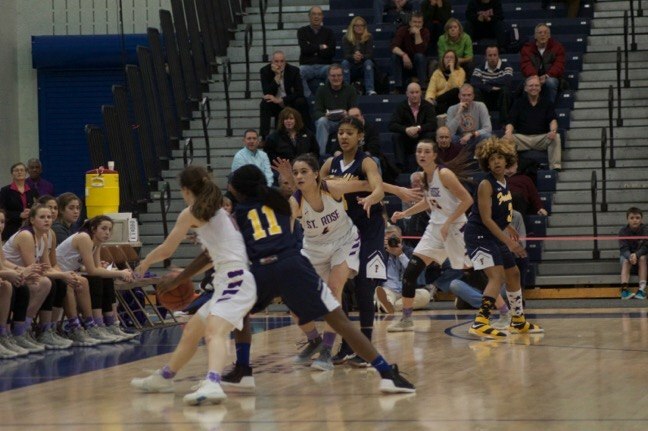 St. Rose answered with a bucket with 36 seconds left to play, and Keona Schenck tied it again with 21 seconds left to play. 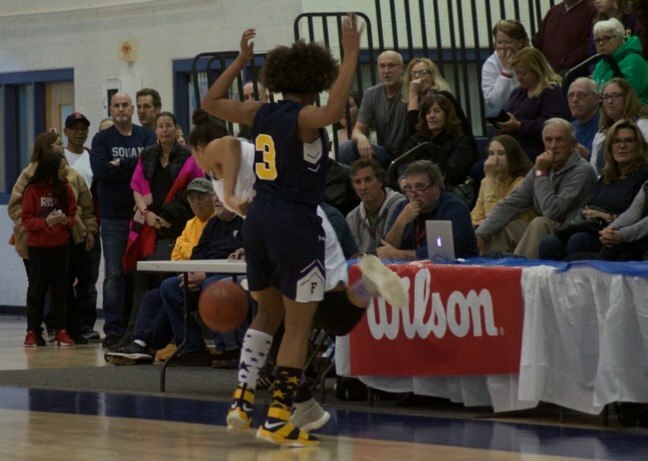 An attempt at a buzzer-beater by St. Rose’s Mikayla Markham missed, and the game went into overtime. 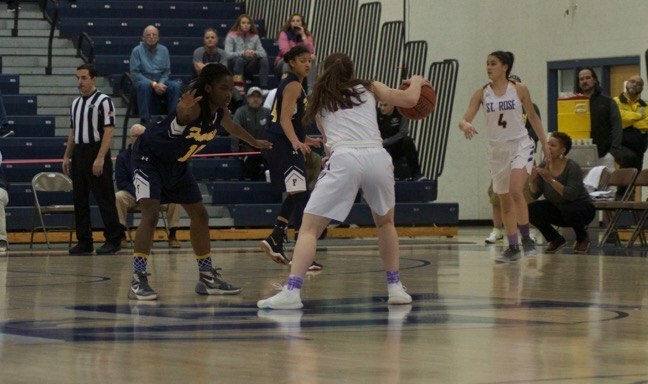 Taylor said one key to the team surviving the overtime was to not foul. 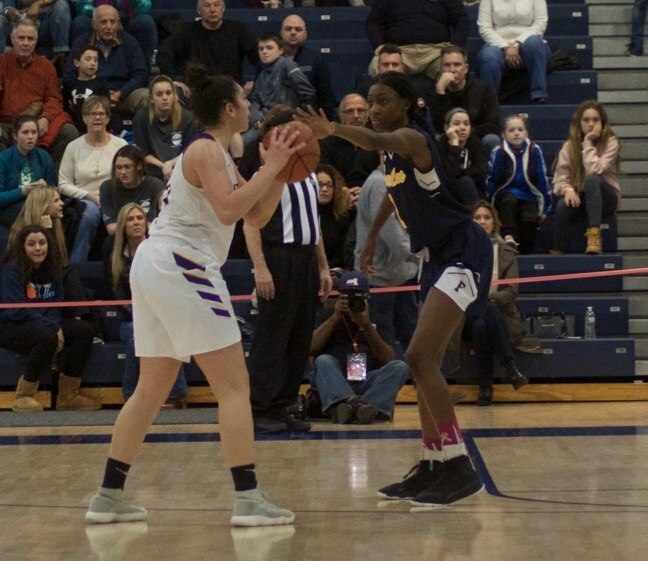 St. Rose’s Lauren Lithgow hit with a three-pointer with 3:09 left in the four-minute overtime period; that seemed to bring life back to the stunned Purple Roses and their fans. 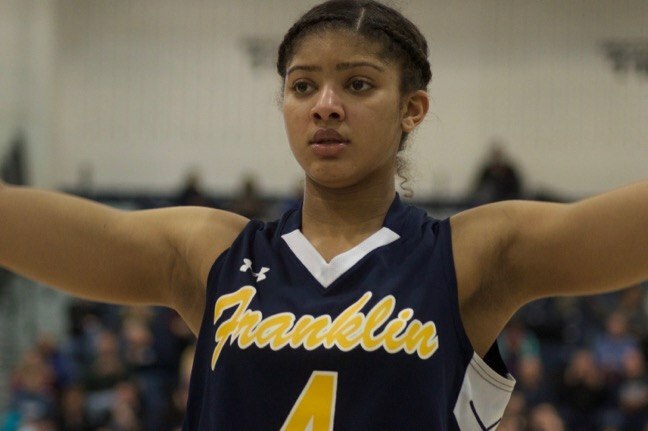 Gray then went one for two on free throws, and then a bucket from outside the arc by Kennady Schenck gave Franklin the lead, 52-51. 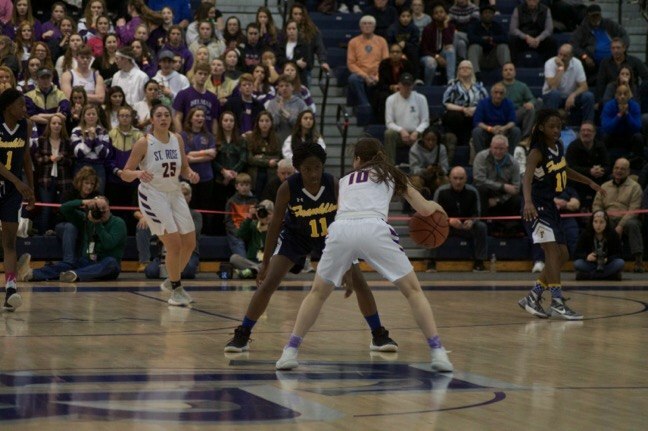 A shot from the paint by St. Rose’s Lucy Thomas gave the Purple Roses a 53-52 lead which was quickly erased by two successful free throws by McCloud, giving Franklin the lead once again, 54-53. 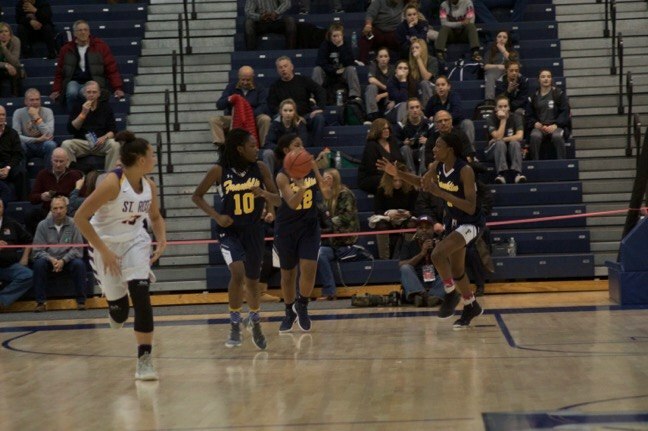 With about 10 seconds left in the overtime period, Kennady Schenck dropped two free-throws to give Franklin a three-point lead at 56-53. 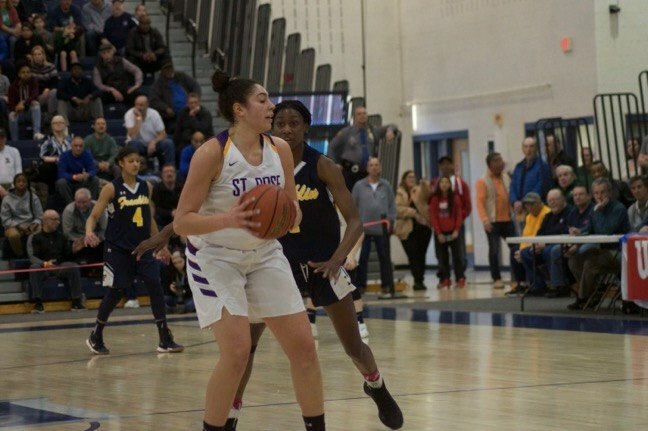 St. Rose worked the perimeter, and finally, with only several seconds left, fed the ball to Markham for a tying three-pointer at the buzzer. 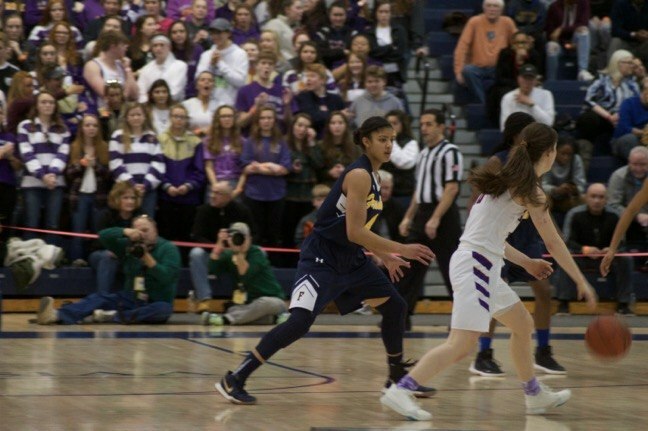 Markham’s shot was blocked by Miller, sending the Franklin fans into a frenzy. 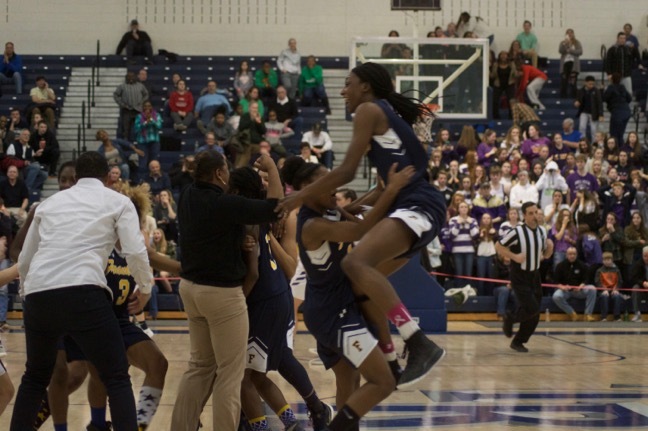 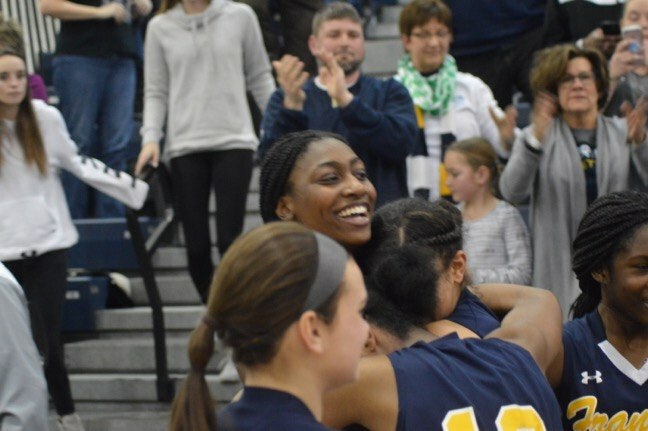 Miller got the rebound, then slammed the ball on the court for emphasis as she and her teammates met in center court to celebrate. 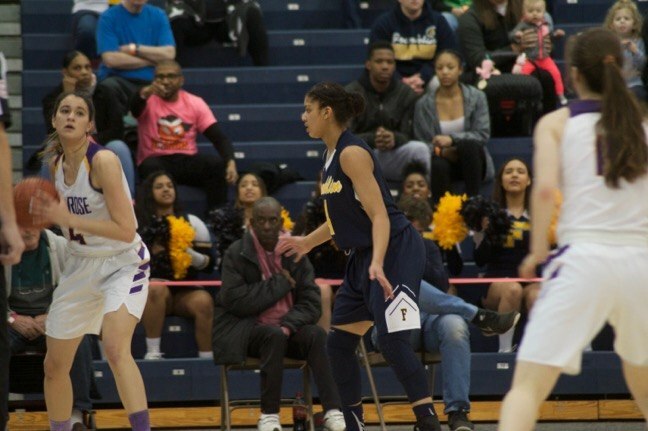 Taylor said that crawling back from a 12-point deficit is a matter of methodology. 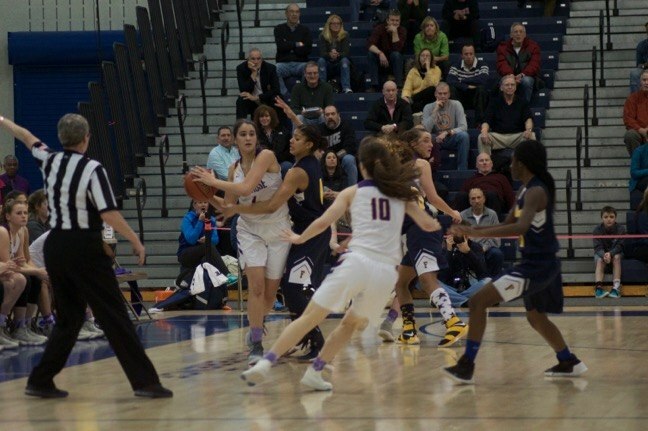 And what about Miller’s block? 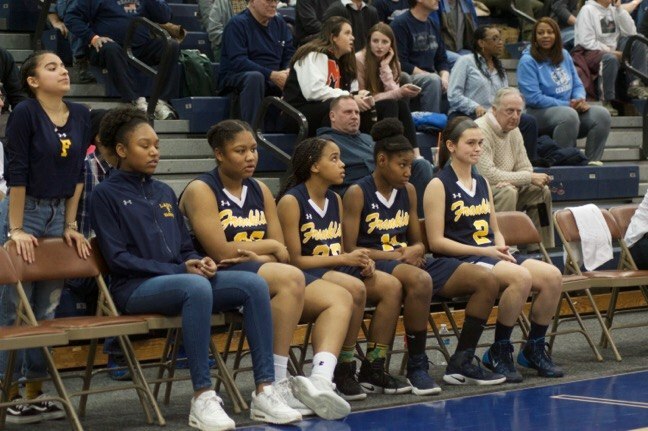 Among those in the bleachers cheering on the Lady Warriors was Miller’s older sister, Adreana, an FHS standout in her own right. 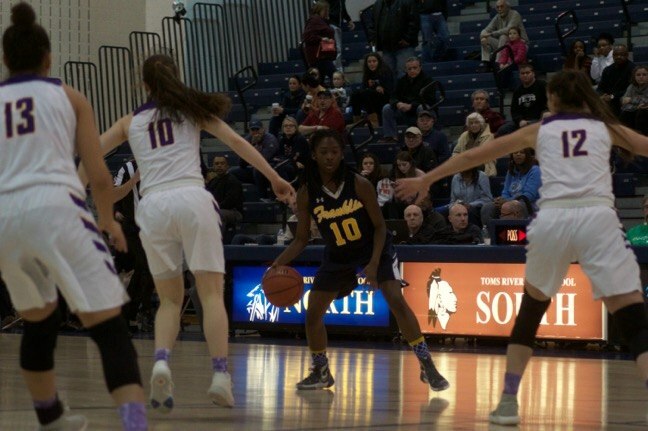 Franklin outshot St. Rose in the second half, going 48 percent from the floor while St. Rose shot just 29 percent from the floor. 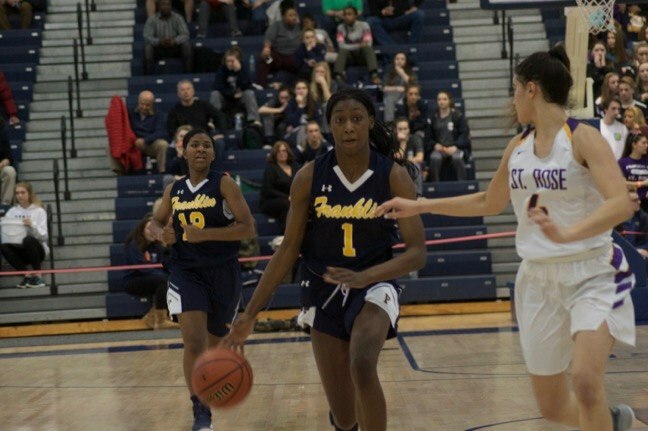 For the game, Franklin shot 40 percent while St. Rose shot 30 percent. 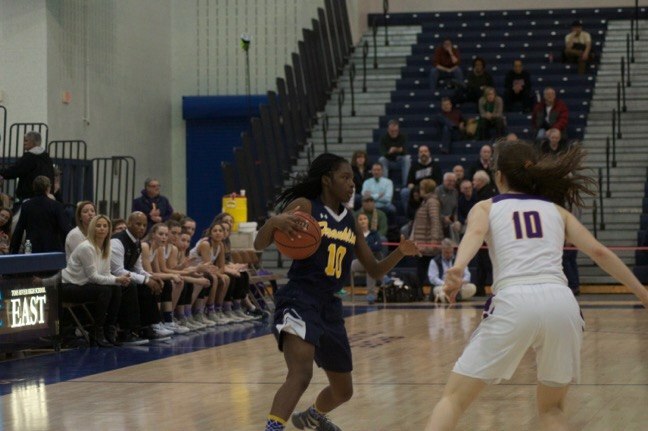 Miller led all shooters with 25 points. 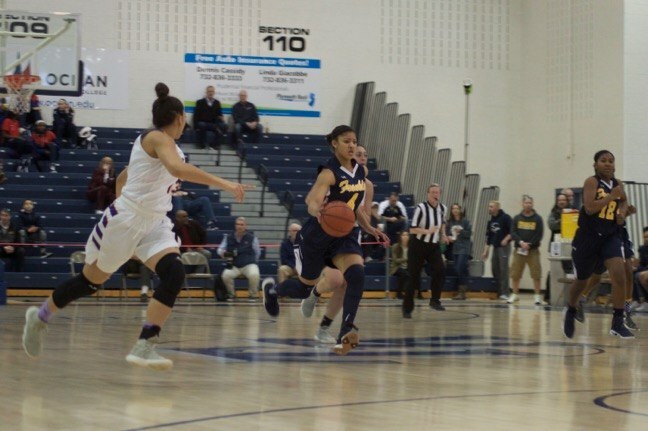 Keona Schenck contributed 10 points, her sister, Kennady, scored nine points. 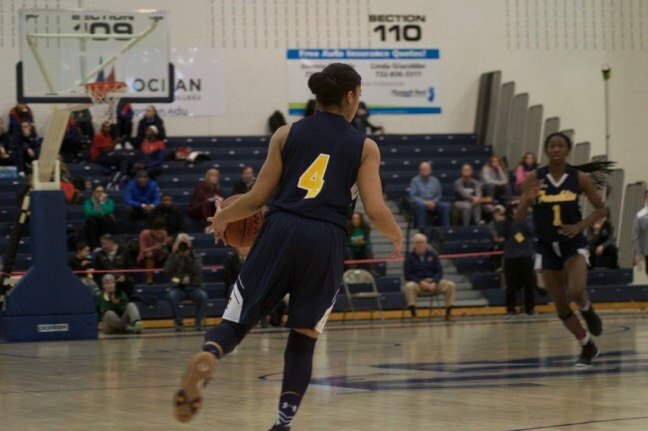 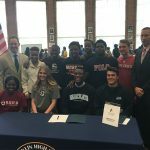 Camille Gray contributed five points, Tiana Jackson, four and McCloud, three points.